Fractional Micro-Needling (also called CIT or “Collagen Induction Therapy”) uses many tiny needles to pierce the skin in a controlled and precise pattern. Not only is this procedure used for collagen stimulation and restructuring but it also offers a direct avenue to put active products to the appropriate skin level for full product potential! If you frequently get cold sores, you should pre-treat with your own prescription anti-viral (Zovirax or Valtrex) or an OTC product such as Abreva. Treatment should not to be done within 48 hours of a Botox injection or 2 weeks after any fillers. Active acne lesions will need to be avoided so as to not spread any infection to healthy skin tissue. To start with, makeup will be removed and pre-procedure photos will be taken. If you desire to start your treatment today (and if we have enough time to give you a complete and meticulous treatment), a topical anesthetic will be applied for 15-20 minutes to assure an aggressive/effective treatment. Skin will be cleansed with a mild cleanser and scrubbed with alcohol. Hyaluronan (moisturizes skin, heals wounds, reduces wrinkles and scars) is pushed into the skin with the vibrating needles until the skin has some pinpoint bleeding. Additional products are applied immediately after the procedure to the open pores including human and animal growth factors, pigment inhibitors and anti-aging products. 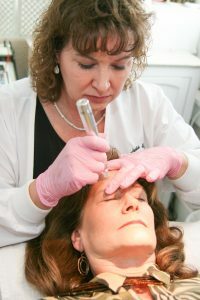 Most clients describe the feeling as “scratchy” or “an intense micro-dermabrasion”. The more sensitive areas tend to be the upper lip and forehead. Treatment area will look red or sun burnt for 12-24 hours. Occasionally scratch marks are noted for 2-3 days after treatment. The skin can feel sensitive or even “hot” due to all the inflammation. Ok to use clean ice packs. It is not uncommon to have some oozing of a small amount of blood and/or some dried pinpoint blood on the skin, especially if you had a deep, aggressive treatment. The procedure and products may cause small pimples in the treatment area-do not pop them-they will go away best if left alone. Keep the treatment area especially clean for 2-4 hours after treatment. No makeup or Sunscreen for 4 hours. Pores will be open so products or chemicals you’re exposed to will have increased absorption. Keep hands off treatment area. Wash with mild cleansers, clarify with mild astringents and re-hydrate with a quality facial moisturizer to the treatment area.